Make no mistake, the Lunchmen are Columbians, through and through. We exhibit an almost unhealthy amount of pride in residing in the Capital City, and will defend any assault on our home turf vehemently and without limitation. However, that is not to say that the Lunchmen never leave the Midlands, or that they don’t enjoy a good road trip. On the contrary, the very reason we are so confident in our love of Columbia and all its culinary delights is that we have traversed this great nation and find no city in comparable size and make-up that can offer the stomach what Columbia can. But, every now and then, when out on the road, a restaurant strikes such a chord with our taste buds that we are duty bound, regional allegiances be damned, to blog about it. No matter where you are, when the food is good enough, attention must be paid. Such is the case with the Blue Ridge Brewery in Greenville, SC. If you are from Greenville, then (1) you are probably reading this on a Macbook Pro, (2) you are already knowledgeable about Blue Ridge Brewery, (3) you think you know of three or four “totally better” places in Greenville that we should have reviewed, (4) and you probably mistakenly think that this article serves as some sort of validation that your town is in any way superior to Columbia. Let me disabuse you of that notion on the front end: it is not. You can give your main street a thousand more face-lifts and pour in as many wannabe hipsters and artisans as you want, nothing in the upstate can match the dilapidated charm sprinkled with Government and Military Architecture that is Columbia, SC. You may have more money, less crime, better roads and superior schools, but you also have Bob Jones University, Traveler’s Rest, and the worst Interstate in the country in I-85. There is just no comparison. Now that we have settled that debate, onto the meal. Work obligations took Rabbit to Greenville last Friday, and I jumped at the opportunity to catch up with dear friend (and Columbia Native) “Cap’n Charley” who now resides there. We met for lunch at the Blue Ridge Brewery on Main Street on a glorious Spring afternoon. It was a Friday, and the weather was perfect, so of course I had to order an appetizer: the Pale Ale. Blue Ridge features four beers that they brew on site seasonally. In addition to the Pale Ale, they also offer a Blond, an ESB, a Stout and Barley Wine. My Beer was cold and refreshing, and set the tone for the rest of the relaxed meal. Unfortunately, Cap’n Charley didn’t partake in the drinking, stating that “this is the heart of the bible belt, I don’t think you can drink at lunch and go back to work.” What a crappy town. I don’t know what they put in the beer at Blue Ridge, but whatever it is it makes you crave their menu. A quick perusal revealed your standard bar fare, but an in-depth reading reveals the care and detail that Blue Ridge puts into their food. They use only fresh and local ingredients when they can, and even make their own ketchup and mustard. I opted for the Cuban, which was Moist and tender Pulled Roast Pork and Ham with Swiss, Mustard, Onion, and Pickles on toasted Cuban Bread. Absolutely stunning. Cap’n Charley went with the Gyro, a Warm, Soft Pita Bread Wrapped Around Fresh Sliced Chicago Style Gyro with onions, olives, feta, lettuce, tomato and homemade Tzatziki Sauce. There were no leftovers. 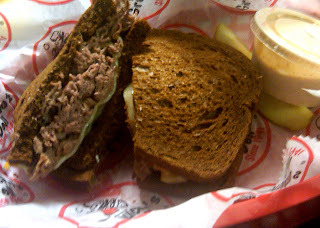 Other interesting items to try are The “Steak Bomb” - Onions, Provolone, Mayo, Bell Peppers, Mushrooms and Sweet Cherry Peppers on a N.Y. Hoagie Roll; and a Pimento Cheese Dip Appetizer - Applewood Smoked English Cheddar and fresh Roasted Peppers with Jalapenos served with grilled Flat Bread. At night, the menu is punched up several notches, and includes Brick oven Chicago style pizza that is apparently unrivaled in the area. The only bad thing about this place is the fries that come with your sandwiches. They aren’t terrible, but I was expecting thick cut, homemade steak fries given the rest of the Blue Ridge Experience. These seemed more like frozen, pre-cut fries I could get at the Grocery Store. A small disappointment, but one worth noting. Overall, the beer was cold, the service fast, the food tasty, and the company delightful. The next time work or pleasure takes me to the Upstate, I’ll undoubtedly make a trip back to Blue Ridge Brewery, hopefully on an occasion when I can try all the beers and not just one. The Lunchmen blog Has been a steadily growing grass roots campaign dedicated to all things delicious for almost nine months. Despite a brief hiatus in December and January during which Rabbit got married to Mrs. Rabbit and Tank managed to break all previously held billable hours records, the site continues to grow and gain new followers everyday. We are always pleased when people ask about the blog or tell us that they’ve enjoyed reading them. You keep reading, and we’ll keep writing. A few Fridays ago, I received perhaps the greatest validation of our growth to date when I met the Publican for a lunch at the venerable Groucho’s Five Points. What originally was planned as a quick call for a Friday with just me and the Publican turned into something much greater when we noticed Publican’s old roommate “The Marlboro Man” at a table by himself gawking at the undergraduate waitresses. We decided to join him and were delighted to learn two other friends would be coming over from another law firm (Tank’s previous employer, coincidentally) that has its own reputation for bold lunch calls. Soon our table was filled out with friends “Eazy-E” and “The Irish Pub.” Eazy-E is another young attorney that was fraternity brothers with Rabbit, the Publican and the Marlboro Man. The Irish Pub is a little bit older, but when he’s not selling his colleagues out to the guys at Granger Owings he is usually up for a good meal or solid happy hour on his way home way out in the country behind the VA.
We all settled in and ordered when the Irish Pub suddenly looked over and said “I love your blog.” I have to be honest, I was so shocked that at first I thought he was talking to someone else. I couldn’t believe that our little site had woven its way through the Capital City legal community to find new fans. (Special thanks to Lunchmen veteran Pizza-the-Hut for spreading the word). To show our appreciation, we promised to include our new fans in this entry. By now you are probably saying to yourself: “Self, when are they going to actually review the restaurant and talk about the food?” Good point. On to the meal. Usually, it all starts with some of the sweetest tea in Columbia served on top of that truly baller pellet style ice. Honestly, I cannot think of a reason that every restaurant in the universe doesn’t use this ice. Why wouldn’t you? It can’t be that expensive, and it immediately earns you street cred with serious diners. In fact, its one of my favorite things about Groucho’s. 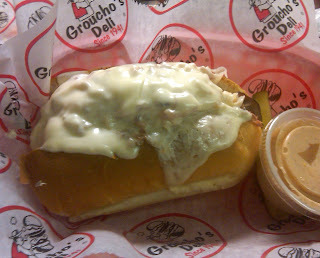 Just about everyone knows what they are going to get to eat at Groucho’s before they sit down. Patrons choose their favorite sandwich (or “dipper” as they are officially known) early in their career and exhibit an amount of loyalty to that selection rivaled only by Sam in the "Lord of the Rings” Trilogy. There being five of us, we had enough people ordering a few different things to get a real sense of the menu. Popular items include the Apollo – Turkey, Ham, Bacon and Swiss on a warm hoagie and the STP – an Apollo with Roast Beef instead of Ham. Classic variations are to order one of these “all turkey” or “all ham,” etc. (Insiders Tip – it’s a good idea to request the bacon bits to be placed UNDER the cheese, not on top, so they do not fall off when you pick up your sandwich). The sandwiches are all sizeable and come out piping hot. However, everyone knows that they are really just the supporting cast for the true star of Groucho’s show: Formula 45 Sauce. For decades, Formula 45 has been a leading culprit of the dreaded “Freshman 15” that plagues gamecock ladies every fall semester. The stuff is like liquid heroine. Hell, I’d probably brush my teeth with it if I could. No one knows what’s in the sauce exactly, but its akin to 1000 Island but about 50 times as delicious (and fattening). I have seen grown men scoop out the last little bit with their finger long after their chips and sandwich had been consumed. They even sell the stuff by the bottle so you can take it home and continue to gain weight. This group was no different, and we were soon licking our plates clean. 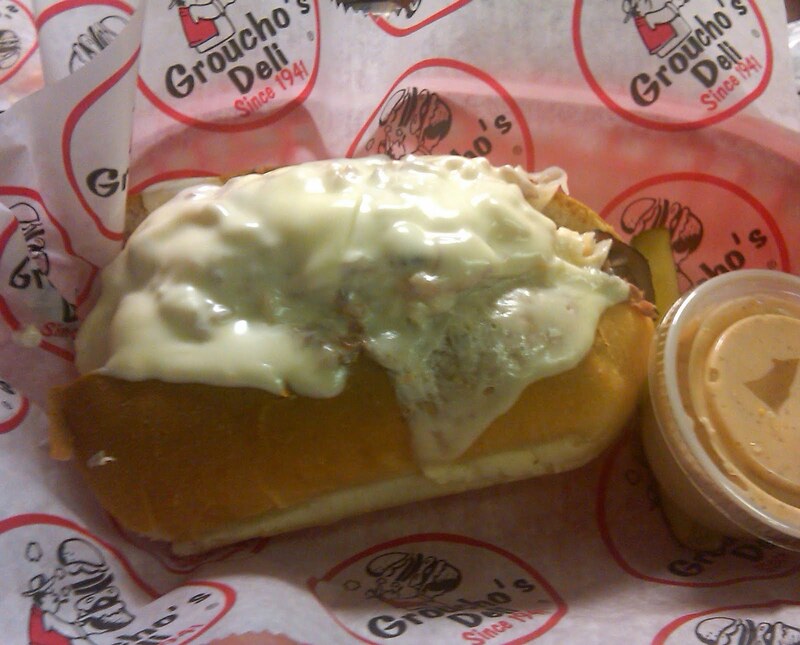 If you can get a table, Groucho’s can be a really quick lunch. They’ve been open for such a long time that the place basically runs itself. Combine that with the fervor and speed with which you will attack your meal and you have the makings for a perfect Friday lunch when you want to go bold, but maybe don’t have the time to commit to a longer choice. Back in our younger days as undergrads, the Publican and I would wake up some (read: all) mornings (read: afternoons) feeling a bit delicate (read: hung-over). After canceling class for the second or third time that week, we’d invariably drag ourselves out of bed and wander over to the then burgeoning Greek Village to our beloved frat-cave. Why? Why else? Free food. Back in the glorious first half of the last decade, the KA house at USC was lucky to serve as the platform upon which Culinary Magician and self-proclaimed hockey fanatic Mike Smith (known commonly as “Chef Mike”) would work his dietary magic – transforming somewhat humble ingredients into meals that college men would devour in a quick minute and return asking for more. The Publican and I have long since graduated, and so to has Chef Mike, so to speak. He can now be found preparing fresh wraps, sandwiches and salads at one of the staples of Vista dining: Garden Bistro. Having lived off Chef Mike’s food for multiple semesters, we went to this popular lunch locale with high expectations. Thankfully we were not disappointed. Located on Park Street behind the Art Bar (which even if you’ve been to you probably won’t admit it), Garden Bistro is tucked away in a space that seems more fitting for an art gallery. In fact, there is plenty of art on the walls to enjoy while you dine. However, the best thing about the Bistro’s location is the large parking lot located on site. Usually trips to the Vista involve Tank making U-turns into spaces that would make Mario Andretti squeamish, followed by knock-down arguments over whose turn it is to pay the meter. Not so at the Bistro, where Kali was able to easily park his luxury sedan within spitting distance of the front door. We walked right in, ordered, and waited for Chef Mike to do his thing. Overall, everyone was pleased, both with the price and quality of the fare. Tank, feeling the last bite of winter on the way in, opted for a smashed three cheese sandwich and cup of chicken tortilla soup. The perfect comfort meal on a chilly day. Kali went with the “Athena” which is a Greek style sandwich wrap, along with a cup of New England Clam Chowder. Sufficed to say, there were no leftovers. Feeling homesick, the Publican ordered the “Upstate,” which he was pleased but not overwhelmed with. Of particular note was his side choice not seen anywhere else in the Lunchmen universe: the bagel chips. The only thing the Publican guarded more closely than these delicious slices was the homemade heath-bar cookie he ordered as an appetizer. I would tell you how good it was, but I never got a bite offered to me. Feeling particularly bold for a Thursday, I eschewed my normal salad choice on the menu and went with the Garden Bounty wrap. While this may sound somewhat weak, let me assure you that it was a hefty entrée, and I didn’t miss the meat. My side choice was, of course, the garden salad, which was also topped with bagel chips. The most notable aspect of our lunch today was that this was a co-ed trip, as the Queen of Frozen Cuisine forsake her waiting microwave meal in the break-room to accompany the Lunchmen (or Lunchpeople, I should say). The best thing about her meal would undoubtedly be the Greek pasta salad (ordered at my suggestion) which is among the best, and underrated, in town.